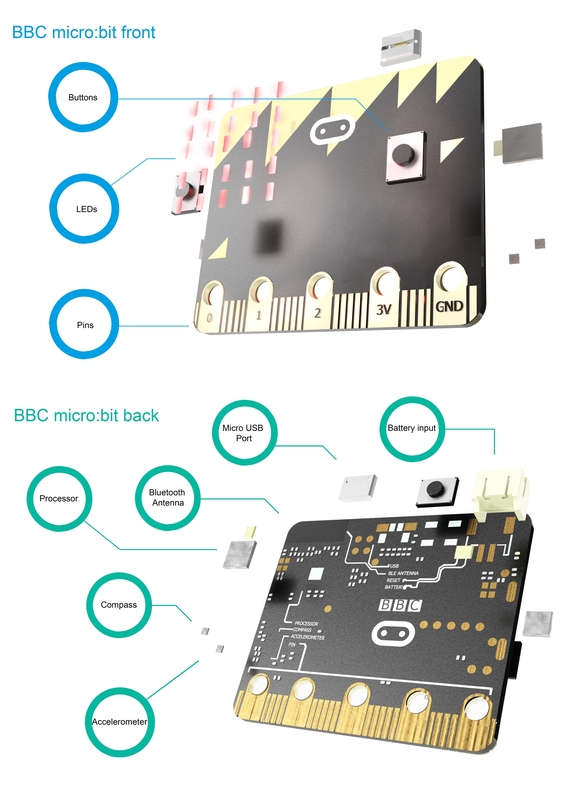 BBC micro:bit Classroom Pack. This pack contains 10 x BBC micro:bits, 10 x 1M anti-tangle USB cables, 10 x Battery cages and 20 x AAA Batteries. BBC micro:bit Classroom Pack. The Classroom Pack consists of 10 x BBC micro:bits, 10 x 1M anti tangle USB Cables, 10 x Battery Cages and 20 x AAA Batteries. This buying option offers a better value way of obtaining multiple starter packs, making it an ideal choice for equipping your classroom. An individual starter pack contains everything you need to connect your BBC micro:bit to your computer and also enables you to power your BBC micro:bit once you disconnect it from the USB.Your BBC micro:bit will come in one of 4 colour schemes, unfortunately it is not possible to specify which colour you will receive. 10 x 1M Anti Tangle USB Cables.